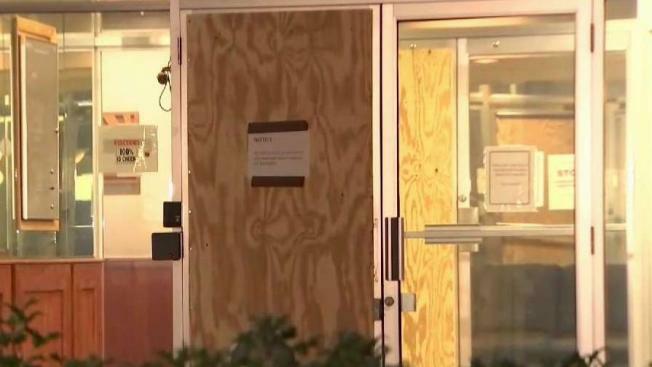 A security guard shot a man who broke through two doors and entered the lobby of WTTG, the local Fox station in Washington, D.C., Monday afternoon. The suspect, 38-year-old George Odemns, said he wanted Fox 5 to make contact with President Donald Trump, sources told News4. D.C. Police Commander Melvin Gresham said at a press conference that he could not confirm that possible motive. D.C. police said Odemns was trying to get into the building on Wisconsin Avenue NW at Harrison Street. He kicked out the glass of two doors and was able to enter the lobby. A female security guard told Odemns to stop as he continued into the main building, according to police reports. When he didn't stop, she fired. Sources also told News4 that the guard tried to subdue Odemns with pepper spray. Odemns was not armed, Gresham said. No one else was injured. Odemns was taken to George Washington University Hospital with a wound to the upper body. He remains in stable but critical condition. Police say he was charged with second-degree burglary, which carries a sentence of two to 15 years if a conviction is made. Odemns is homeless and has a history of contacting local news stations, including Fox 5, WUSA and News4, in long, rambling emails. In August, he was charged with assault on a police officer who was attempting to break up a verbal argument, according to police documents. Fox 5 staffers wrote about the incident on Twitter as it unfolded. "Everyone is okay," anchor Jim Lokay tweeted. "Sources tell us suspect tried to get into our secure building. Security guards opened fire." "Man was conscious as he was transported into ambulance a few minutes ago. Surreal to be reporting on this," wrote reporter Lindsay Watts about 3:30 p.m.
D.C. Mayor Muriel Bowser said she met with police chief Peter Newsham to discuss the situation. Police said the call for the shooting was made about 3 p.m. They are checking surveillance cameras in the area for more information. No further information was released immediately on the intruder's motive. Police did not identify the security guard or specify her whereabouts.